Las Vegas (March 6, 2018) – Four-division world champion Erik “El Terrible” Morales has confirmed that he will appear and have a booth to Meet & Greet his fans at the Las Vegas Convention Center for the fourth edition of Box Fan Expo that will take place Saturday May 5, 2018 from 10a.m to 5pm, during Cinco De Mayo weekend. The Boxing Expo will also coincide with the mega fight between Saul “Canelo” Alvarez vs Gennady “GGG” Golovkin, that will take place later that evening. Morales will have merchandise to sell to his fans, as well as photos, signatures and memorabilia. This is Morales first appearance at the Boxing Expo and is looking forward in meeting his fans. 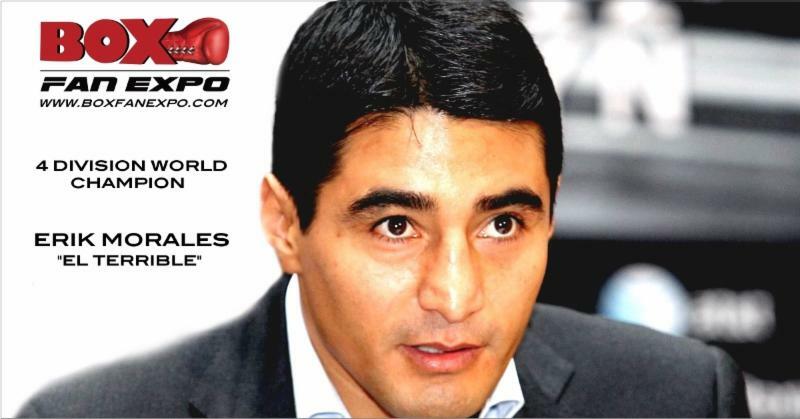 Erik Morales Nicknamed “El Terrible,” is a retired Mexican boxing legend and is being inducted into the International Boxing Hall of fame in Canastota on June 10th, 2018). Morales compiled a 52-9 record in 61 fights, including 41 straight wins to start his career, and won world titles in four different weight classes (junior featherweight, featherweight, junior lightweight, junior welterweight). He also ended Manny Pacquiao’s six-year unbeaten streak in 2005 with a unanimous decision win. Morales notable fights came against Marco Antonio Barrera (nicknamed “The Baby Face Assassin”). The Morales versus Barrera trilogy is one of Boxing’s most famous fight trilogies of all time, involving two of Mexico’s most revered boxers. Their memorable fights were also named Ring Magazine’s fight of the year on February 19, 2000 and once again on November 27, 2004. Box Fan Expo has been a huge success with fans and boxing industry people. Many boxing stars have attended the last two Expo’s such as Mike Tyson, Floyd Mayweather Jr., Roberto Duran, Tommy Hearns, Marco Antonio Barrera, Roy Jones Jr., Marcos Maidana, Sergio Martinez, Keith Thurman, Danny Garcia, Tim Bradley, Deontay Wilder, Amir Khan, Shawn Porter, Fernando Vargas, Zab Judah, James Toney, Vinny Pazienza, Mikey Garcia , Mia St.Johns, Leo Santa Cruz, Badou Jack, Terry Norris , Riddick Bowe , Earnie Shavers, Leon Spinks, Danny Jacobs, Abner Mares, Jorge Linares, Brandon Rios and many more…Exhibitors such as boxing gear, apparel, new equipment, energy drinks, alcohol, supplement products, broadcasting media, sanctioning bodies and other companies who wish to participate will once again have a chance to showcase their brand to fans, media and the boxing industry.